yoshix had the most liked content! Yes! Everything has been submitted, just waiting for it to go live any day now. I finally took this costume out for a troop on the beach. We made a video to promote trash pickup awareness. I had a few things go wrong, including my vocoder falling off and having to superglue it back on and the velcro not holding together to keep my ankles tight together. I think I'm going to replace that with snaps. Surprisingly although the helmet is so small, I was able to fit my fans in there so I wasn't dying or fogging up with the warm humid weather. 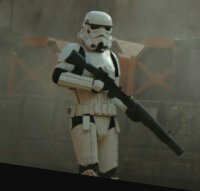 I couldn't be happier right now Hot Toys 1/6 scale figure or 501st approved costume? Eventually I'll be offering them for sale. I need to fine tune the molds a little better first. I'm so close to finishing my helmet. As you can see the bobblehead problem is no more. I just need to finish painting. I'm having a bit of trouble matching the white on my armor but I think after I put a little weathering on it won't be noticeable. The last thing I need to do is make a mold for the vocoder. I'm really looking forward to buttoning this project up. Sculpt is done! Its by no means perfect, but I'm happy with it. Every time I touched it i was changing something and at some point you just have to stop and say "enough is enough". Now I'm molding. This is all so new to me and I'm super nervous to ruin what I've been working on for so long. Oh, and I got this sweet flashlight for night ops! Some small side notes if anyone is interested. I would love to be the CRL model for the Crystal Patrol Trooper as well. I have the pack and orange pauldron ready, I just really want to finish up this new helmet mold first to have for the photos. Hi all! After obsessing overreference photos and comparing my costume I came to two conclusions. One, my Black series helmet makes me look like a bobblehead. And two, it is missing some of the details from the scene used helmets. 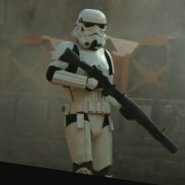 I know jimmiroquai makes a helmet as well but from what i can tell, it looks like a recast of the Black Series with some small differences. Which doesn't help my size problem. So about seven months ago I decided to start working on my own helmet sculpt. Unfortunately life got in the way more than once and I have had to start and stop this thing several times. Within the last month I have made some good progress and I thought I'd share. Please remember this is still a work in progress and there are still many areas that need to be finalized, so don't look to hard at the vocoder its just temporary. I know I need to clean up the eyes and frown, but I'm very happy with the proportions. And that last photo is to give you an idea of the size difference compared to my ATA helmet. Today I ordered everything I need to make a mold and start casting. I hope to have a prototype in a month. That may be wishful thinking, we shall see. So, what do you guys think? Please be soft with me, I have a hard time with criticism. I normally don't post unfinished projects. Wow, 2-3/8! See I would have guessed less. Thank you. Very helpful. I'm going to go check out your build thread to see what i can find.